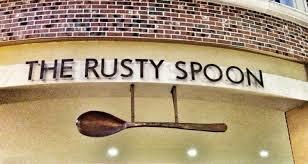 The Rusty Spoon – 55 West Church Street Orlando. At lunchtime today we decided to visit the Rusty Spoon in the very heart of Historic Downtown Orlando. I had heard good things about the restaurant, as indeed it has gained 7 Silver Spoon awards in 2014 and voted “Best farm to table” restaurant, also recently coming second in the Orlando Magazines “Best Downtown Restaurants of 2016”. The restaurant itself has no particular theme or design, but benefits from large windows that give great views of the bustling Church Street vibe and the occasional SunRail locomotive as it departs the adjacent Church Street Station. Booth and table seating is in the majority and the restaurant has a large bar in the main room facing the street, there is a second adjoining room behind the bar which could afford a more relaxed atmosphere if this is your preference and where you will find the booth seating. A sort of theater kitchen is in evidence through a large open doorway with prep area and food service. A great space, and could be utilized for a “Chefs table” to further add another “Unique Selling Point to the Rusty Spoon offer. James Beard Award Nominee and Iowa native Kathleen Blake, is responsible for the direction of the menu, and as you expect from her plethora of awards, she takes every opportunity to select locally sourced fresh produce with accredited provenance for menu inclusion. As with most restaurants with a “Farm to Table” offering the menu is short but concise, with a few special items of the day. Items described as “Sustenance “are only available at dinner service, but bulk out the menu with another circa 4 to 5 items daily and feature more options that you would describe as Main Entrees. Great to see no “Flowery” descriptions on the menu, just the simple ingredients listing and then left to the waiting staff to answer questions or further describe the dishes (More on that to come). We chose the Crudité from the First Plates section on the menu as an appetizer, and it was simply described as “A taste of the Season”. Further description from our waitress Brittany secured the decision. Although not a massive portion, the taste far outweighed the size. The dish comprised of delicately fried Okra, crumbled Feta Cheese, fried Green Tomatoes, Red Chili and Watercress. All of the above ingredients were perfectly balanced with a unique chef inspired sauce of Honey, Balsamic Vinegar and Jalapeno which had a remarkable similarity to Wasabi (In a good way). Rusty Fish & Chips – The dish comprises of four fish fillets seasoned with Old Bay and fried in the most delicate batter I have ever eaten. The accompaniments were Vinegar Slaw (not too acidic), chef made Tartare Sauce and the Rusty Spoon Signature Haystack fries, (Shoe string fries seasoned with finely chopped Rosemary and finely grated Pecorino cheese). Bauk- Bauk – A sandwich of Chicken Salad, Green Tahini, Scallions, Cucumber and Sunflower Sprouts served on an unusual but delicious Moroccan bread. As a choice of side we again opted for the fantastic Haystack fries. This sandwich had a great, clean texture and flavor, with an interesting combination of ingredients that worked well together and well thought out. Service was great, Brittany provided attentive and knowledgeable service and was an obvious fan of the food and food production, being able to describe the elements of every dish and make superb recommendations and insight. Attention to food detail is evident here, even the ketchup was chef inspired with elements of additional herbs and spices that raised it to another level. The Rusty Spoon has an interesting and extensive wine list with great Bottle and by the Glass options and they also feature Domestic, Craft, Draught and Imported Beers and Ales, including local brews such as Maduro Brown from Cigar City Tampa, and American Lager from Due South Boynton Beach. As this is a Downtown Orlando location parking can be confusing, options available are as follows: The West Building – The SunTrust Building and at The Plaza, all within one block of the restaurant. After 6pm and on Sundays there is free parking along Church street. Ask for the “Rusty Cocktails’‘ list the “La Diosa” is an unusual must try. Pricing at the Rusty spoon is mid-range for this style of operation, but the food inspiration and quality is top level and outstanding, making it a ‘Must Visit” for any Orlando native or visitor, they have placed the attention and direction of the restaurant firmly in providing the best food quality and provenance and not masked the offer with over the top theming to distract the diner. I will return and sample the Dinner selections soon.